If your old washing machine is on its last legs and you’re in the market for a new machine, take a look at the Currys PC World range of washing machines. From cheap washing machines that have the basic functions to high-end models that feature all the latest developments in laundry care such as energy efficiency, multiple programmes and ultra-fast spin speeds - you’re sure to find the best washing machine that’s right for your household. Each person has their own idea for their ideal washing machine. Whether you are looking for something with a bigger capacity, larger spin cycles, or a low noise level, Currys PC World have a fantastic selection of models. And whatever your budget, we will have the best washing machine for you. 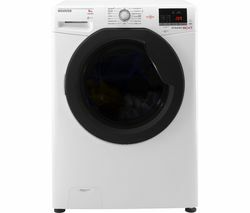 Currys PC World stock all of the leading brands including the likes of Hoover, Beko, LG, and Bosch washing machines available in store or here online. We also stock a wide selection of washer dryers, tumble dryers and dishwashers to complete your kitchen. 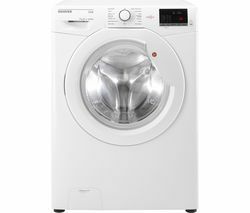 Find out all you need to know about washing machines from our Washing Machine Buyers Guide.